How much inner Melbourne trash on outer South East beaches is acceptable to you? Were you again conned into picking up inner Melbourne litter on outer south east bay beaches on Clean Up Australia Day? Each year Frankston, Kingston, Bayside and Mornington Peninsula Shire Councils spend hundreds of thousands of dollars collecting drift litter from your local beaches. Each year hundreds of volunteers spend thousands of hours doing likewise. Predominantly this litter's origin is not local. It comes from the north and is carried to our beaches by the Bay's prevailing clockwise currents. Yet the state government's Litter Mafia still preach behavior change, wetland filters and exhort volunteers to collect trash in what is essentially a shameless cost shifting exercise that's being conducted by the City of Melbourne and other northern bay and river front municipalities. Included in this cost shifting rat pack are the cities of Port Phillip, Melbourne, Hobsons Bay, Yarra, Maribyrnong, Boroondara, Melbourne Water and Sustainability Victoria, Parks Victoria and the EPA who continue to sit on their hands. Hundreds of parking tickets and other traceable litter items emanating from these municipalities can be regularly found in on beaches as far south as Mornington. 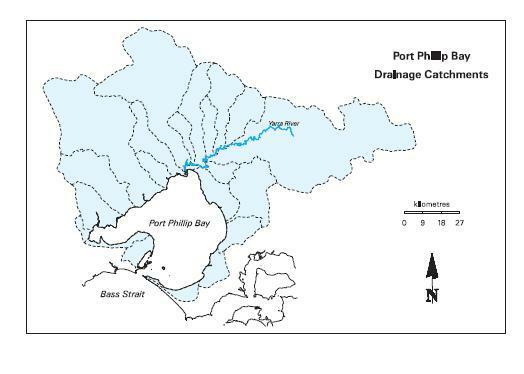 Seasonally heavy rain and the occasional "event" in the lower Yarra catchment flushes trash from municipal and Melbourne Water storm water pits to the Bay where it is carried south by the prevailing clockwise current generated by the strong North Westerly winds that often accompany the rain. Bayside, Kingston, Frankston and Mornington Peninsula (and Dandenong) councils have all fitted high performance CDS centrifugal litter traps to known problematic drains. These traps will remove cigarette butts, syringes and particulates smaller than a match head. So why don't these municipalities and Melbourne Water use these high tech traps to keep this and other crap off our beaches?? The answer is the "cost of their clearance" meaning it's cheaper to "educate". So please don't settle for another free t shirt or bumper sticker - you have better things to do with your time. Pick up the tickets, get them to your local mayor and state MP and demand that that this and the accompanying garbage is intercepted where it is generated. And please, please South East MP's and Councillors don't swallow the Litter Mafia line that progress is being made by a plethora of committees educating the scummy masses because its clearly not. The evidence is on your local beaches about a week after a big dump of rain and an accompanying north west wind. (Mothers Beach Mornington, Seaford Beach @ McCullough Avenue, Mentone (@ stinky corner), Rickets Point (@ the yacht club), Sandringham breakwater, Hampton, North Road, StKilda harbor, and Port Melbourne (near the piers).